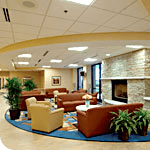 If you think of interior design of medical facilities as picking out homey furnishings and a friendly color spectrum, it’s time for a short, friendly tutorial. In reality, designing healthcare environments is a complex discipline that draws on biology, chemistry, patient-outcomes research, psychology, physiology … and the list continues. SSOE’s interior designers explained how this varied knowledge comes into play in the day-to-day work of specifying healthcare facilities. Materials and finishes are among hospitals’ arsenal of weapons to prevent nosocomial (hospital-acquired) infections and to establish sterile areas. In the majority of today’s hospitals, seamless floors and countertops, anti-bacterial carpets and upholstery fabrics are standard, which explains the prevalence of solid surface counters and work surfaces and the popularity of carpet tile or vinyl backed carpeting. Although rubber is low on glamour, it is a popular option for hard floors since it is both naturally anti-bacterial and durable. And even if it sounds like something from a sci-fi novel, there are fabrics that kill bacteria on contact and reduce them to dust. Manufacturers continue to broaden their product lines to include more anti-bacterial options that are aesthetically pleasing. As an example, ceiling tiles now come with an anti-bacterial finish. The rise in numbers of bariatric people and their tendency to have more health problems has increased the need for furnishings — doorways, seating, beds — that accommodate greater size and weight than the average person. Although wall-mounted toilets are preferred in other areas because they are easy to clean around, they can’t handle as much weight as the floor-mounted versions. On the opposite end of the spectrum are the children’s areas where small scale is the guiding principle. More lobbies and waiting areas incorporate play areas and toys to keep children occupied during a visit. Rather than the bright colors typically associated with children’s spaces, pediatric wings are now using toned-down palettes because research has shown they have a calming influence. “Old eyes” tend to perceive color with a slight yellow cast. To compensate, environments need to use contrast to improve the visibility of items like handrails and doorways. Spaces need to be well lit, but without glare. Limitations in mobility affect many interior choices, from seating and beds to the layout of patient rooms. Also, HIPAA’s (Health Insurance Portability and Accountability Act) mandate, that patients’ records be kept private, affects the layout of check-in areas. Visual barriers are needed to protect information from being seen by others when patients are filling out forms. protection so they can withstand daily bumps and bruises. Thanks to “evidence-based design,” interior designers can validate the importance (and expense) of creating “calming” patient rooms. Studies show that patients’ environments play a role in reducing both their length of stay and the need for pain medication. The trend is to create connections to nature through the use of natural light, pleasant exterior views, art work, and wood or wood-looking finishes. Designers select materials that can reduce the noise levels and make the space more conducive to rest. Private rooms include space and furniture so loved ones can spend the night. The overarching goal of the environment is to reduce the amount of stress patients experience while recovering. SSOE has two of the nation’s 75 healthcare interior designers who have met the demanding qualifications of certification by AAHID (American Academy of Healthcare Interior Designers). Candidates have to be NCIDQ-certified (National Council for Interior Design Qualification), have five years experience in healthcare design, and submit a portfolio of their projects just to be eligible to take the AAHID exam. As these few examples illustrate, minus the expertise of healthcare interior designers, medical staffs would find healing even more challenging.